Master of International Security graduate Claire Bibby (centre) receiving her award with Commissioner Ian Stewart of Queensland Police and assistant commissioner Debbie Platz, Australian Federal Police, (president, Australasian Council of Women and Policing). A Massey graduate’s thesis, on the role of police communications in ensuring women’s voices are heard during decision-making in international conflicts, has earned an Australasian policing award. 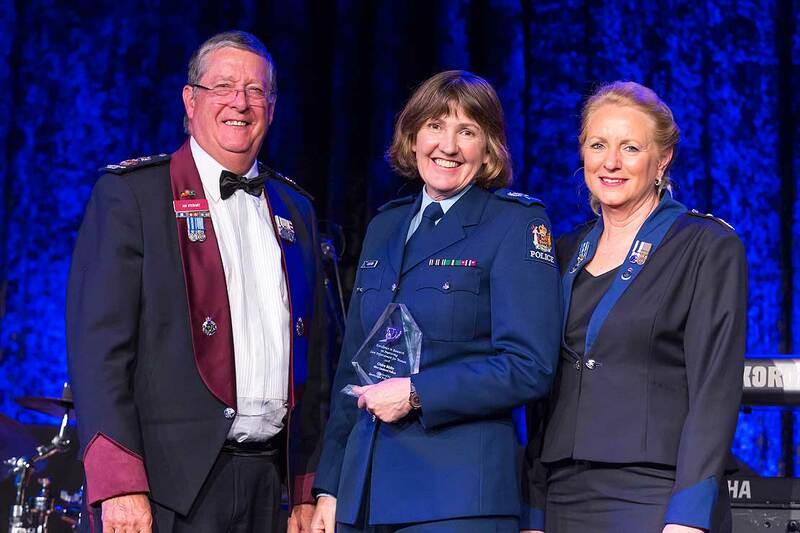 Master of International Security (Intelligence with merit) graduate from 2018, Claire Bibby, who is employed as a senior sergeant with the New Zealand Police, won an ‘Excellence in Research to Improve Law Enforcement for Women’ award. She was recognised at the Australasian Council of Women and Policing Excellence in Policing Awards last month in Perth, Australia for her research, “Using communication strategies to operationalise United Nations Security Council Resolution 1325 Women, Peace and Security". In her research, she explored the New Zealand Police approach to implementing the resolution in the Asia-Pacific region, and undertook the research towards her master’s degree through the Centre for Defence and Security Studies. Her thesis focuses on police communication between people of the same and different gender and examines the role of police communication in enabling the voice of women to be heard in decision making to prevent conflict, as well as during conflict and post-conflict. It highlights the barriers police face, and the opportunities presented, when police value the role of women as leaders in peace and security. “My research provides evidence of the value of understanding communication approaches and how to form an evidence-based communication strategy that benefits the agency and its personnel implementing the resolution,” she says. Countries like New Zealand and Australia, which provide police as mentors and trainers in the Pacific and other parts of the world, have an important role to play in regional and international security and police communication with diverse members of all communities – and being inclusive of women is critical to that role, says Ms Bibby, who graduated earlier this year. Senior sergeant Bibby is the continuous improvement advisor at New Zealand Police National Headquarters. She contributes internationally as a subject matter expert on resolution 1325 including peer-reviewing training on Women, Peace and Security for the Australian Civil-Military Centre, addressing the first UN Women Asia-Pacific Regional Symposium in Bangkok on the resolution, and has addressed the UN Women Arab States Regional Workshop in Jordan in a non-policing role.